"Othello, newly married to Desdemona who is half his age, is appointed leader of a military operation to defend Cyprus from the Turks. Iago, his ensign, passed over for promotion in favour of young Cassio, persuades Othello that Cassio and Desdemona are having an affair." 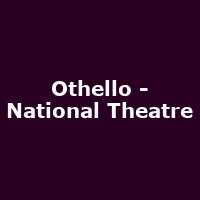 Adrian Lester, last seen at the National as Henry V, takes the title role, playing opposite Rory Kinnear (Iago), whose recent appearances at the National include Hamlet and The Last of the Haussmans.